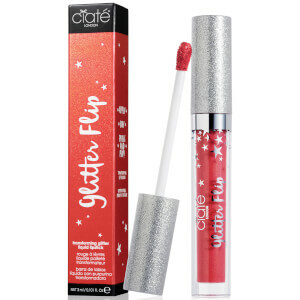 Step up your lip game with the Glitter Flip Lipstick – another world first product from Ciaté London to take your pout to dazzling new dimensions. The innovative liquid lipstick goes on as a metallic matte with intensely opaque colour coverage; once dry, simply press your lips together and witness an instant transformation into a multi-dimensional, super glittery finish with no mess or fallout – like magic! Delivering vivid pigmentation and long-lasting staying power, the lipstick is effortless to apply with the doe-foot applicator and there’s no need for touch-ups thanks to the comfortable, long-wearing formula. Vegan. Free from parabens and gluten. Simply apply one even coat directly to lips, leaving to completely dry for 2 minutes. Now press your lips together and watch it transform before your eyes. After watching several reviews on this product I just had to get it, and I was so pleased to find it on this website. The deep red is fabulous and the multi-colored glitter in the tube makes this unique product totally worth the buy. Product wise, I will say that this lipstick does transfer even after dried, something that I was misled about, but the transfer is minimum and it is still wonderful. After wearing this for several hours there was absolutely no fading or blotchiness, and it continued to release glitter every time I pressed my lips together. The glitter was extremely visible and the lipstick wasn't very gritty at all despite the amount of glitter that is visible. The color is very wearable, although it is quite bold so it may not suit everyone. For the delivery, I did receive this a little late, but only a couple of business days and this definitely does not take away from my purchase. I am overjoyed with this product and will return to this website again for future purchases.